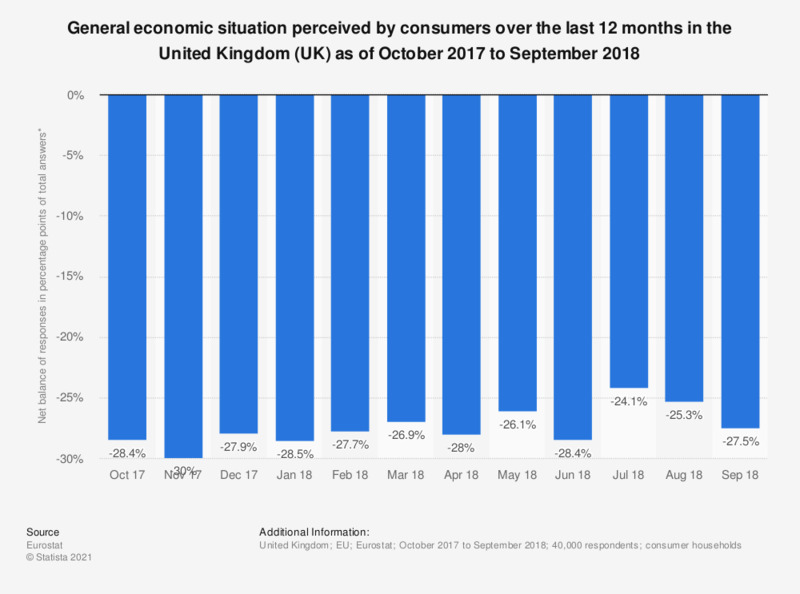 This statistic shows the perception of the general economic situation within the United Kingdom (UK) over the last twelve months from October 2017 to September 2018. The perception of the economic situation deteriorated in comparison to the previous month (net balance of responses amounted to -27.5 percentage points of total answers) as of September 2018. * The data are published as a net balance i.e. the difference between positive and negative answers (in percentage points of total answers). Seasonally adjusted data. The data published every month are derived from surveys conducted by national institutes in the Member States. The purpose of the Eurostat consumer survey is twofold: first, to collect information on households' spending and saving intentions, and second, to assess perception of the factors influencing these decisions. The questions pertain to four topics: the households' financial situation, the general economic situation, savings and intentions with regard to major purchases. Statistics on "Cosmetics consumer behavior in the U.S."
Where do you search for and purchase beauty and personal care products online? U.S. population: Which brands of blusher / bronzer do you use? Do you read magazines (either offline or online) which are mainly or partly about beauty and cosmetics? Do you follow any online blogs which are mainly or partially about beauty and cosmetics? How many blogs about beauty and cosmetics do you regularly look at? How often do you watch YouTube product review videos about beauty and cosmetics? How often do you watch YouTube tutorial videos about beauty and cosmetics? How often do you watch YouTube haul videos about beauty and cosmetics? Do you prefer videos by companies which produce cosmetic products or from personal accounts and bloggers?